Here’s a walk that I have done many, many times and I thought I’d share it with readers of Mad About Madrid. We will start off in the Glorieta del Emperador Carlos V (or the Glorieta de Atocha). Atocha station, which occupies the south side of the square, is the main railway station in Madrid, and trains from both the Madrid community and the Spanish regions arrive here. The station was inaugurated in 1851, destroyed and rebuilt in 1892. The old terminal building was taken out of service in 1992 and turned into a shopping centre and tropical gardens. The latter is a great place to chill and take in some of the 500 plant species. Atocha station is also well-known as the place where 191 people were murdered in 2004 and you will also find special consoles there where you can leave a hand silhouette and message. To the West of the square you will see the Ministry of Agriculture, Fishing and Food. The building was completed in 1897 and with its Corinthian columns and winged statues on its roof is very impressive. Heading South-west of the Plaza you will find one of three museums which make up Madrid’s Golden Triangle (the other two are the Prado and Thyssen), the Museo Nacional Centro de Arte Reina Sofía. The art on display in this museum is mainly Spanish and includes one of the most well-known paintings in the world – Picasso’s Guernica. Head north off the square and you start to walk up the Paseo del Prado. The word “Prado” in English means meadow and was the place outside the main city walls where Madrileños used to go for recreation. The Paseo del Prado is one of the main boulevards of Madrid and, like much of this part of the city, came about under the reign of Carlos III. Around this time the area was covered in trees and the idea was to convert it into a place with gardens and trees and with the urban design of José de Hermosilla fountains (Cibeles, Neptune and Apolo) would be added. On the west side of this boulevard you will see the Real Jardín Botánico de Madrid (Royal Botanic Gardens), again under the command of Carlos III (in 1781). It covers around 8 hectares and has around 5,000 different plants and trees from around the world in its collection. Given the uneven terrain it occupies, the Botanic gardens have various terraces for different types of plants and trees. Towards the end of the boulevard, also on the west side, you will find one of the most finest art galleries in the world – the Prado Museum. The museum was opened in 1819 and over time two further buildings were “incorporated” into the Museum – the Casón del Buen Retiro and the Salon de Reinos. The former housed Picasso’s Guernica, when it was returned from the USA and before it went to the Reina Sofía Museum. On the opposite side of the Paseo del Prado you will find some of Madrid’s “literary” streets leading off from there – c/ de Leon, c/ Huertas, c/ Lope de Vega, c/ Cervantes. Miguel de Cervantes – author of Don Quijote – actually died in c/ de León. Lope de Vega – another famous author lived in c/ Cervantes and other notable Spanish writers like Quevedo and Góngora also lived in this district. That is why the barrio is now called Barrio de las Letras. At night time this area becomes a hive of activity when Madrileños and tourists hit its many bars and restaurants. At the end of this first stretch of the Paseo del Prado, you will find the Plaza de Cánovas del Castillo – often called Plaza de Neptuno because of Neptune’s statue in the middle of the square. The fountain was designed by Ventura Rodríguez in 1782 and created by Juan Pascual de Mena between 1780 and 1784. It used to be situated more towards the Plaza de Cibeles and actually looked towards it as opposed to looking towards the centre of the city. Surrounding this square you will find some of the most popular attractions in Madrid. On the West side you can see the Palace Hotel – the place where US presidents, rock stars and whole array of “A” list of celebrities. On the east side you will see the Ritz Hotel and the Prado Museum can be seen on the North East side. If you walk up the road which runs between the Prado and the Ritz, you will see the Convent of San Jerónimo “el Real”. It has over 500 years of history and the king Alfonso XIII was married here and the current king had his coronation here. Finally, you can see the Thyssen-Bornemisza Museum on the North side of the square. Our walk will take us north along the Paseo del Prado, continue on to the Paseo de Recoletos and up the Paseo de la Castellana. If we head north from the “Jupiter’s Square” and walk up the left-hand side of the Paseo de Recoletos we will go past the Thyssen Museum. In amongst the trees, about 200 metres from Neptune, you will see the Fuente de Apolo (Apollo’s Fountain) and is the 2nd of the 3 statues designed by Ventura Rodríguez for this part of Madrid – the others being Neptune and Cibeles. On the opposite side of this street, you will see an obelisk in the Plaza de la Lealtad, which was originally dedicated to the Madrileños who were killed by the French on the 2nd May, 1808 (the day is now a holiday in Madrid) and since 1985 the monument has been dedicated to all Spaniards who have died in conflicts. Just behind this monument you will find the Spanish Stock Exchange. beforehand to make an appointment: 91-589-22-64). Walking on north you will come to arguably one of Madrid’s finest plazas, the Plaza de Cibeles. Here, in the centre, you will find one of the city’s favourite monuments: the beautiful Fuente de Cibeles (Cibeles Fountain). 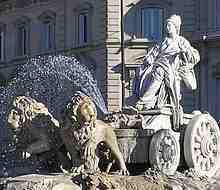 The goddess of fertility, Cibeles, is seated on a chariot and is being pulled by two lions. This is the third of Ventura Rodríguez’s fountains and was built between 1777 and 1782. This fountain has a special place in the hearts of Real Madrid supporters who congregate around it when their team wins any title of note: Spanish League, Champions League or King’s Cup. Incidentally, Atlético Madrid supporters celebrate around Neptune. interesting features surrounding this square. Looking directly West you will see Alcalá street which leads to the Puerta del Sol. The road which appears to veer right is Gran Vía which leads to the Plaza de España. Look at the building which is at the intersection of these roads and look up – you will see the beautiful Metropolis Building dome. On either side of c/ Alcalá you can see the headquarters of the Spanish Army (right) and the imposing building on the left is that of the Bank of Spain. On the North East side of the square you will see the Palacio de Linares. The Palace dates back to 1877 and was the Palace of the Marqués of Linares. It has a very interesting, if not sad, history. On the other side of the road you will see one of the most beautiful buildings in Madrid – the Palacio de Comunicaciones. – for many years the principal gateway into Madrid. It was built under the orders of King Carlos III in 1778 and it is said that during the Spanish Civil War a huge portrait of Stalin hung beneath its arches! Walking north again the Paseo del Prado becomes the Paseo de Recoletos. This tree-lined boulevard plays host to craft and book fairs during the year and is where you will find some of Madrid’s famous outdoor (and indoor) terrace bars. 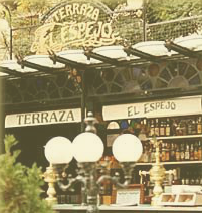 On the left-hand side of the Paseo you will find a famous Madrid cafe – Café Gijón and further on still you will see another well-known café – Café El Espejo its crystal terrace bar can be found amongst the trees opposite the cafe). On the other side of the Paseo de Recoletos (its east side) you will find the Palace of the Marqués de Salamanca which was built in 1855 and, I believe, is now owned by BBVA bank. At the end of the Paseo de Recoletos you will see the National Library of Spain. Though the first brick was laid in 1866 it was not until 1896 that it opens its doors. The building is actually shared with the National Archaeological Museum of Spain – though curiously, its entrance is on Serrano street. stands at 17 metres. Just under the statue is a water cascade, which you can walk under, and here you will find a restaurant and the Cultural Centre of Madrid. or Market of Peace which was built in 1882. Not far from the square you will also find a couple of department stores – El Corte Inglés, for one – and a shopping mall. For those who need their fix of Americana, they will find comfort in the Hard Rock Cafe. heads uphill towards the Plaza de Santa Bárbara. Here you will find the pleasant residential area of Alonso Martínez – the British and other embassies are dotted around here and the PP political party has it headquarters on Genova street. I would recommend the Cervecería Santa Bárbara for a beer and if you’re looking for chocolate heaven head off to Cacao Sampaka.